For a few years now I’ve listened to a great podcast related to search engine optimization (SEO) and Internet marketing. Chuck and Chris from E-webstyle deliver an informative and entertaining episode every couple of weeks or so. They may cover SEO, video marketing, blog writing or any other topic related to marketing your business online. They provide tips on what you must do to market yourself online as well as advice on tactics to avoid. Each podcast is no more than 30 minutes, so they are perfect for a workout or a drive in to the office. While the listener obtains valuable lessons, it’s the good-natured banter between the two that makes you want to keep listening. They make it seem like you’re a friend of theirs sitting down for a chat. Granted, a bit of a geeky friend! The podcast is suitable for lay people and professionals alike; I find that I pick up valuable tips even though I’m “in the business.” They may approach an issue from a different perspective, or have handled and discuss an issue that I haven’t yet come across. Internet marketers are always learning something new. I intend to keep listening and wholeheartedly encourage GoatCloud visitors to do the same. 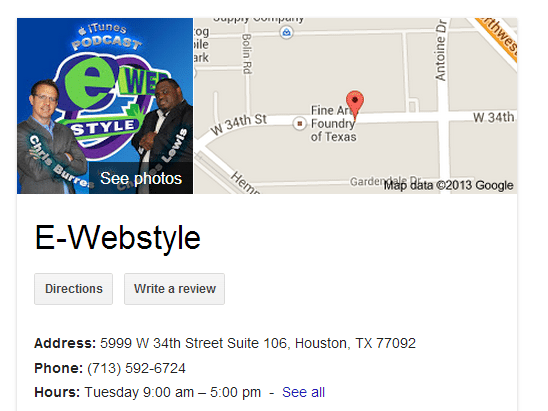 Click here for: E-webstyle’s “SEO Podcast Unknown Secrets of Internet Marketing”. Tell them the Goat sent you!